SignUpGenius is a powerful event management tool that helps create online signup forms and coordinate group events. Is SignUpGenius right for you? Founded in 2008, SignUpGenius simplifies the process of organizing events and volunteers by supplying online signup forms for a range of organizations regardless of their size or budget. With up to 14 million users per month, SignUpGenius has proven itself as an intuitive, powerful and flexible tool suitable for individuals, businesses, nonprofits, schools, churches, sporting clubs, and even families. The software incorporates a step-by-step wizard and includes over 900 customizable themes allowing users to create professional online signup forms without requiring any technical background or programming experience. Users can coordinate with volunteers and participants through automated email invites, text reminders and group messaging, while real-time reporting enables users to monitor event registrations, volunteer hours and fundraising efforts. The rich functionality and usability of the SignUpGenius wizard means you can schedule any type of event ranging from a simple church fair to a more complex multi-day event, like a sport tournament. SignUpGenius recently introduced online payments, which makes it possible to sell tickets, services, and products, as well as take donations all from your signup form. However, in exchange for providing a payment platform, SignUpGenius charges a small fee, which can be covered by the buyer or seller. With award-winning customer support and an affordable price, SignUpGenius is a smart choice for budget-conscious organizers looking for a simple way to create professional signup forms for their events. 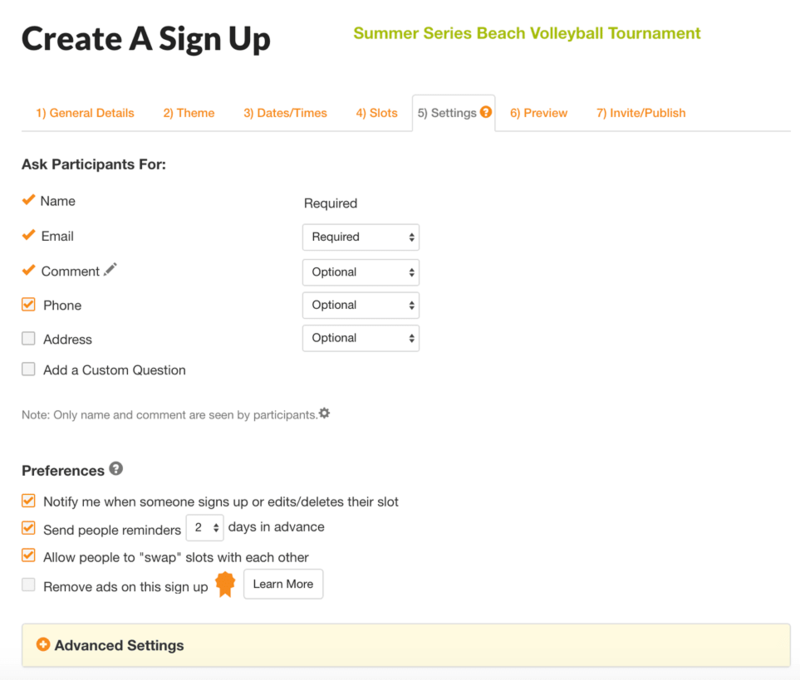 SignUpGenius offers a range of signup forms, messaging options, and integrations to help organize events and volunteers. Below, we will discuss how these capabilities can be used to benefit your business or event. Like many other event management tools, SignUpGenius allows you to create professional online signup forms using the step-by-step wizard builder. To begin creating an event, you'll first need to enter the general details of your event, including a title and description. You can then customize the font style, size, and color to reflect your event and branding. You can search for a theme using keywords and categories, in addition to uploading your own image or logo. 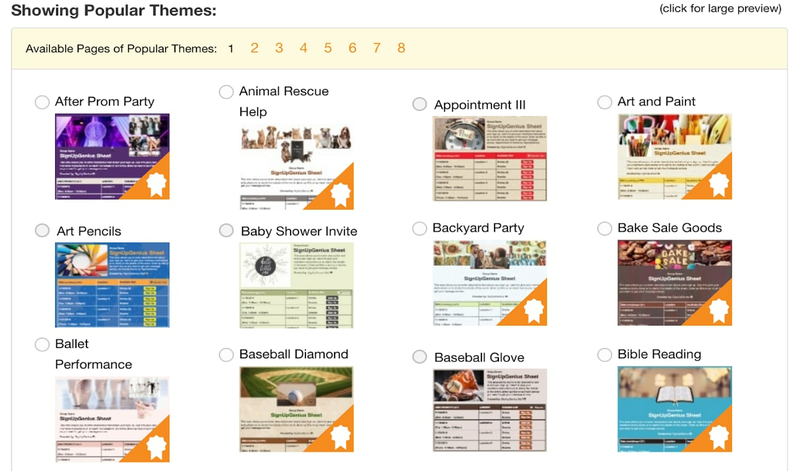 SignUpGenius comes with over 900 preloaded themes designed to suit a wide range of events. Paid subscribers have access to a growing library of premium themes making it easier to find a suitable signup form for any event. Alternatively, paid subscribers can create a custom template using the theme editor. You can choose between 12 unique layout options. You can also customize colors, upload multiple images, and gain access to thousands of stock photos. Although paid plans receive enhanced theme customization tools, customers have mentioned the creative process, and overall design of the themes is outdated and can look cluttered. However, the robust functionality of the SignUpGenius wizard makes building almost any signup form possible, and reasonably straightforward. You can create simple one-offs or recurring events, as well as more complex events with time slots, multiple days, and different locations. This is particularly useful when organizing complex events, such as school interviews, graduation ceremonies or sports tournaments. The ability to set a maximum number of participants or preferred number of volunteers further helps to streamline event coordination. Event organizers can use signup forms to collect a range of personal details from participants. For example, you can ask each participant to provide their name, email, and phone number, in addition to asking custom questions, such as dietary preferences, medical history, volunteer experience, etc. Users on the Basic Plan (free) are only allowed to ask one custom question per month, as opposed to 25 on the Platinum Plan. Before publishing your signup form, you can preview it in both a list and calendar view, with an option to make any last edits. Invites can then be sent through the SignUpGenius platform or via a unique link that can be added to your website and shared across social media. Paid users also have the option to include a button on the invitation with a link back to their website. Free users will not have this option. The easier it is for people to sign up for events, the higher your conversion rate will be. Once you publish your signup form, visitors can register for an event on any device (desktop or mobile) without the need for an account. After signing up, participants and volunteers can make changes including cancelling their registration, requesting a refund, swapping time slots and updating personal information. To assist organizers with event coordination, sign ups are automatically synced with both attendee, volunteer and administrator calendars keeping everyone informed and up-to-date. Paid versions of SignUpGenius include premium functionality that simplifies the creation and execution of an event. Users can assign start/stop dates, which is a handy tool for popular events that have limited or in-demand time slots. For example, you can set up forms to automatically start accepting participants on a specific date/time and stop accepting after a specific date. Last-minute signups can be prevented by using a locking feature, which allows you to customize the number of days before the event that you want to stop anyone from editing, deleting or signing up. This is particularly helpful when coordinating volunteers, allowing you to focus on what’s most important in the lead up to an event. Ideal for large, ongoing events with multiple dates, SignUpGenius allows you to auto-hide dates from the past or future that would otherwise clutter the page. For example, you can hide dates that are more than two days old or 60 days in advance. SignUpGenius also provides useful features for organizing group-based events, including the ability to assign administrators to each group. You can create admin-only tabs on the signup form to provide specific information to administrators. You can also configure emails to be automatically sent to notify administrators when a participant signs up, swaps time slots or cancels a registration. Keeping participants and volunteers informed about your event is challenging, but also essential to ensure every event is a success. Users can leverage SignUpGenius send a specific number of monthly emails to keep participants and volunteers informed, with paid users able to utilize advanced communication functionality such as email grouping, email scheduling, email attachments and themed email invites. Email grouping is beneficial when organizing large multi-day events, such a two week period of parent-teacher interviews. For example, you can quickly send targeted emails to parents who have an interview on a specific day. Another particularly helpful feature of SignUpGenius is the ability to create personalized reminders and confirmation emails. While this is helpful for maximizing attendance numbers, this feature is also helpful for communicating additional information to your event participants in your automatic confirmation emails. For example, you may ask participants to bring certain items to the event, or attach an event map, or other essential documents such as waivers. Paid plans also include text invites and event updates. SignUpGenius simplifies payments and donations by allowing participants and benefactors to make payments directly through your sign-up form. Friends and families can easily collect money for a joint gift, and professional organizations can raise money and sell a variety of tickets, products, and services. You can display products with a picture, offer discounts and even arrange refunds. SignUpGenius has partnered with WePay and accepts payments made via credit and debit card. For buyers, the payment process is easy, as they don’t need to create a SignUpGenius account to make a purchase or donation. However, the company does charge a fee of 5% for each purchase made through the signup form plus an additional $0.50 per transaction. You can choose to cover the fees or pass onto the buyer. It should also be noted that payment functionality is currently only available to customers in USA and Canada. SignUpGenius provides a comprehensive range of reporting options that enable you to track everything from volunteer hours and signup activity to email delivery, open and click-through rates. You can also create transaction reports to keep track of your donations or purchase history. Generated reports can be exported to Excel for analysis. Organizing events and people becomes even easier with SignUpGenius’s extensive range of integrations. SignUpGenius utilizes Zapier, enabling users to import contacts from third-party applications and increase the exposure of their event. Key integrations include MailChimp, Constant Contact, Facebook, Gmail, AOL, Salesforce, and Windows Live. Since its release in 2015, the SignUpGenius mobile app has been well-received by users. The app has virtually the same functionality as the web-based software and is designed for both event organizers and participants. Participants can browse and register for events, make payments and swap time slots through the app, while organizers can create events, send messages to group participants and view online reports. Signup forms are responsive and adapt to an array of screen sizes. The app is free to download on Google Play or through the App Store. However, it is currently only available to residents of the USA and Canada, and your signup forms will still show advertising if you're on the free plan. SignUpGenius and SignUp.com are popular solutions that simplify the process of organizing people and events. Both systems offer a free version for an unlimited number of participants, without requiring participants to sign up for an account before registering for events. Both companies also provide mobile apps, although, although the SignUpGenius app is free to download whereas SignUp costs $1.99 to download from Google Play or the Apple App Store. Advertisements are shown on both companies’ signup forms. However, SignUpGenius is more upfront about this and provides the option for premium plan holders to opt out of advertising. SignUp charges an additional fee on top of premium plans to remove advertising. Also, participants and event organizers on SignUp are automatically enlisted to receive third-party advertising emails. In terms of functionality and breadth of premium features, we’ve found SignUpGenius to be the winner, especially when it comes to advanced emailing options, such as email themes, scheduling, and reporting. Both companies deliver customer support in the form of video tutorials, FAQs, email, and phone. SignUpGenius also offers immediate phone support, whereas SignUp offers coaching calls after an email request. SignUpGenius is a versatile event management solution that eliminates the need for paper forms and reply-all emails by enabling recipients to register for events online. The software is an excellent choice for anyone who wants to simplify the process of coordinating people and events. Since SignUpGenius offers a free version, as well as tiered pricing, the software meets a wide range of needs and budgets. The only drawback is that signup forms created on the Basic Plan have advertising, and unless you are on the Platinum Plan, you can only create a limited number of signups without advertising. Compared to other event management tools, SignUpGenius provides an exceptional range of free functionality and customizable features. With customer support among the best in the industry and pro plans starting at only $9.99/month, the company provides incredible value for money. If you’re looking for a better way to organize your events, recruit more participants, and simplify payment, then SignUpGenius is an excellent tool that can help save you time and increase your efficiency.